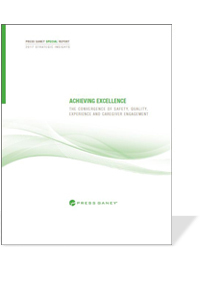 Our 2017 Strategic Insights Report, Achieving Excellence: The Convergence of Safety, Quality, Experience and Caregiver Engagement, offers deep data and cross-domain analyses that demonstrate the important relationships between and among the drivers of care and their influence on financial performance. Targeted insights and case studies provide actionable strategies for nurturing a high-performing culture and achieving value-based, patient-centered care. Complete the form to receive your copy of the report and learn more about these interdependent relationships and how building a culture that supports and sustains caregivers can help your organization move forward on the path to health care excellence.